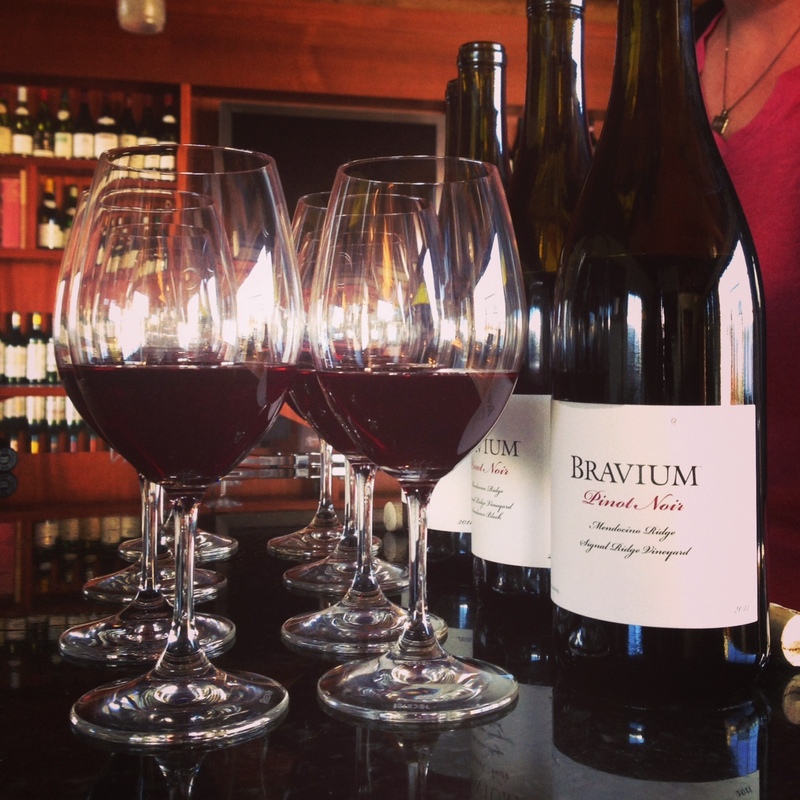 We met there to taste through the not-yet-released 2011 Bravium Mendocino Ridge Signal Ridge Vineyard Pinot Noirs made by Derek Rohlffs of Bravium. 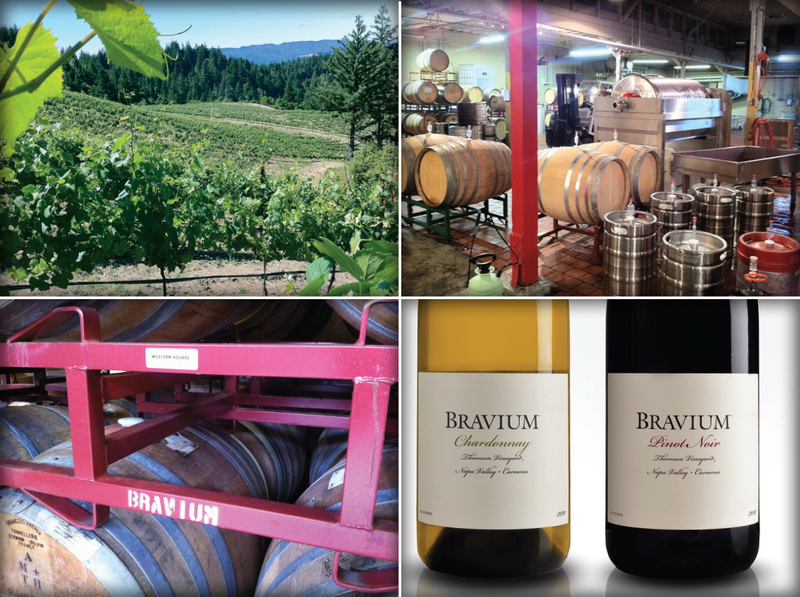 When Winelandia was but a twinkle in our eye, Tala and I took a trip to Treasure Island to visit Bravium’s facility and pick Derek’s brain on wine, the wine industry, wine sales, winemaking – you get the idea. It was a great visit and he was incredibly considerate, forthcoming, and knowledgeable. Did I mention he sent us away with his four Mendocino Ridge Pinots to taste through and provide notes? He did. How lucky are we? And so, the stage is set for us on this afternoon. We started with the Jackpot Block, and I’m glad we did. This wine was fun, fresh, and fruity. If I were to add another F, it’d be feminine. This bottle had the most acid of any of the four we tasted, and acidic reds are Tala’s bailiwick. It’s super bright and light-bodied, with loads of cherry on the palate. The aroma is perfumy, and we both found a hint of asian spices (maybe Chinese five-spice? ), as well as some resinous, piney qualities that we enjoyed. The second bottle in our line up was the most aromatic of the four. We both found eucalyptus on the nose, some violet, white pepper, and some musky aromas too. It was very restrained and elegant in flavor – not a punch-you-in-the-mouth Pinot at all, but rather quite delicate. The finish here is medium-plus. Okay, this one was hands down both our favorite. It was deep and brooding, with intense cola and herb aromas, balanced flavors, and that silky texture that the best pinot noirs offer. This wine was savory, with great balance between texture, flavor, acid, and body, and I would drink it every day if I could be so lucky. In contrast to the Sundance and the Jackpot, both Tala and I found this wine to be masculine, and while the aromas were lovely, it was really all about the way it felt on the palate for both of us. Of the four, this one has the most aging potential. This bottle is a blend of the preceding three blocks, and we were easily able to pick out aspects of each wine. We found this wine to be balanced and rich, with some piney aromas, and a healthy dose of the familiar cherry. The texture on this wine was great – it was medium bodied and luscious, but not flabby or overbearing – the acid carried through. It was a great note to end on, for sure! As soon as we can, we’ll update with release dates, prices, and where to buy. These wines are not yet available for the public, but will be shortly, so stay tuned if you’re interested! Ever wonder how your favorite restaurants prepare chicken with perfectly crispy skin, steaks that are evenly medium rare all the way through, and fish that is seared to perfection while being perfectly cooked and delicate inside? It’s not some kind of cooking magic, no. It’s a really simple method called Pan Roasting and I am going to tell you how to do it. Read and re-read this whole thing before you begin! The first thing to consider is the temperature of what you are about to cook. Meat that is cold on the inside is not going to cook evenly. Ever have a steak that was burnt on the outside and too rare in the middle? It was probably too cold when it was cooked. If you are cooking a thick steak it’s probably good to take it out an hour or so before you cook it; longer for roasts. Obviously there are all sorts of food safety things to keep in mind and you shouldn’t leave it out all day, but for the most part it’s a standard practice to let red meat and pork steaks sit out at room temperature for a little while prior to cooking. I even like to let chicken sit out at room temperature for a half an hour or so prior to cooking. Fish you don’t need to worry about as much because it is delicate and cooks very quickly and it’s more prone to developing nasty flavors when it’s not kept ice cold. Thick steaks: Leave out at room temp for 30 minutes to an hour prior to cooking. Pork chops/steaks: Leave out at room temp for 30-45 minutes prior to cooking. Chicken: Leave out for 30 minutes prior to cooking. Fish: Don’t bother leaving this out prior to cooking. The second thing to consider is salt. Ever have a steak that didn’t get that delicious crust on the outside and instead it seemed to “steam” in the pan? Chicken with floppy skin? Gross, dude! We don’t want that. Unless you are cooking a big roast that needs the salt to penetrate which will also spend enough time in the oven to dry it out, don’t salt your meat until RIGHT before you cook it. Salt draws the moisture out of meat, thus creating moisture on the surface which will steam while it cooks. This prevents the sear from forming. I pat everything as dry as I can with paper towels prior to salting and cooking. If you are cooking chicken, it also helps to rinse it in the morning, pat dry, and chill uncovered in the refrigerator until you are ready to cook it. This dries out the skin so it will get nice and crispy. On a related note, there are several other factors that prevent a sear or crispy skin from forming. 1. Crowding your pan. Always use a pan bigger than what you are trying to cook, particularly if you are cooking multiple pieces of meat. Give them some space, you never want them touching. 2. Temperature. You want to get that pan HOT prior to putting the meat on it, but not so hot that it burns the oil. You can test the temperature by pouring a tiny drop of oil onto the pan. If it smokes like crazy, turn down the heat a bit and wait until the oil only shimmers when hot. Burnt oil tastes bad. NEVER use olive oil for searing as it has a very low smoke point. 3. Movement. Never, EVER, move the meat until it’s time to flip. Don’t be all nervous and constantly check to see if it’s browning. Trust me, it is. You will know it’s time to turn it when the sizzling noise quiets down. That means most of the moisture is gone and it’s searing. You can check progress by lifting a tiny corner, but don’t ever lift the whole thing with a spatula until it’s done. Now, with all these very important things considered, you are ready to begin. 2. Get your oven-proof skillet hot over medium-high heat on your stovetop (but not too hot). 3. Salt your chicken, pork or beef generously (fish less generously). Grind some fresh pepper over it too. 4. Pour a little oil on the pan, just enough to coat the surface when you turn it. You don’t want oil pooling. We aren’t deep frying. 5. Throw down your chicken skin-side down. If you are not cooking chicken with skin, it doesn’t matter what side you start on (duh). You should hear a loud sizzle; if you don’t then your pan didn’t get hot enough and you should let it get hotter next time. 6. Let it cook over medium-high heat until the loud sizzling becomes less loud. Don’t mess with it or move it around. Generally this takes around 3-4 minutes for pork and beef. Bigger pieces of meat will take longer. Once the sizzling quiets down, lift a tiny corner to see how it’s doing. If you are cooking fish, this is going to happen much faster so keep an eye on it. 7. If it’s nice and brown, flip it with a spatula (fish) or tongs (pork chop, steak, chicken). Nothing should stick if it’s seared properly. Chicken should be skin-side up now. 8. Turn off the stove-top heat and put the whole pan into the pre-heated oven. Now comes the tricky part. Every oven is different, and every cut of meat cooks at different speeds. Additionally, everyone likes their meat cooked to different doneness. It takes time and practice to get this down perfectly, so be patient and don’t give up. 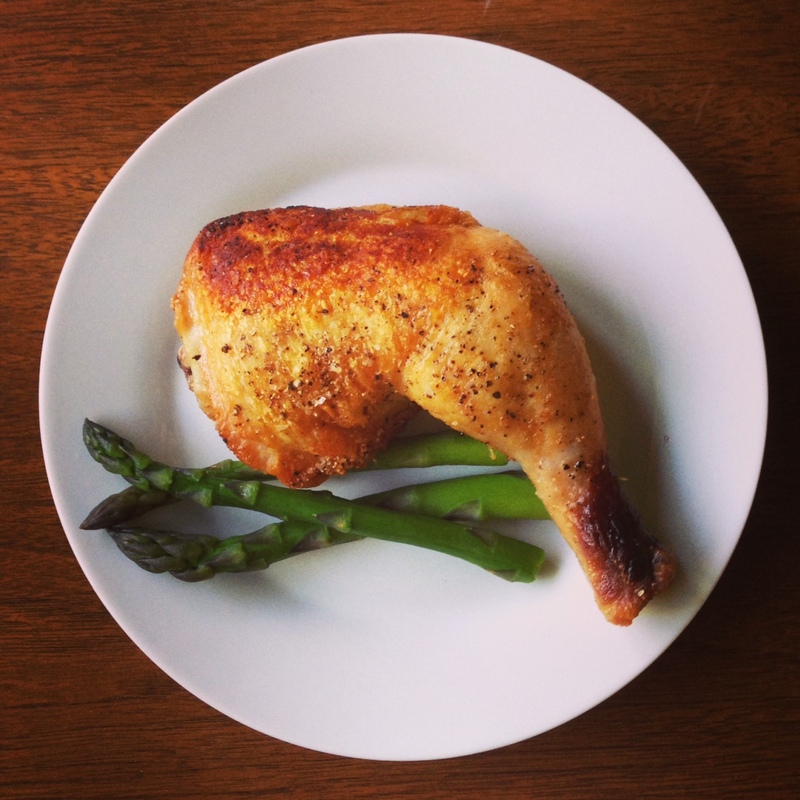 Chicken: This is the easiest protein to cook. I cook my chicken legs (drumstick and thigh as one piece) for exactly 20 minutes after they go into the oven. Chicken breast I cook for exactly 15 minutes (if they are big) and 13 if they are small. Beef: Cooking time will vary based on the thickness and size of your steak. I like my red meat perfectly medium. I am able to tell how done it is by poking it with my finger. The squishier it is, the rarer it is. The firmer it is, the more done it is. If you are going for medium like I would, I would check my filet mignon after 4-5 minutes. Ribeye I would check after 5-6 minutes. Lean meat cooks faster than fatty meat. Try to resist the urge to cut into it to check because this causes all the juice to leak out. Get intimate with your food. Poke it with your bare finger and learn how it feels when it’s at different levels of doneness. Pork: This is pretty much the same as beef. I like my pork perfectly medium. If you have never tried a medium pork chop, do it immediately. You will not get a parasite. Restaurants can legally serve pork at 140 degrees (medium). Fish: Fish is going to cook in a flash. I like my fish a little on the rare side. Depending on the thickness, start checking it around the 2 minute mark. Don’t overcook it! Once your meat comes out of the oven, remove it from the skillet to a warm plate in a room temperature part of your kitchen (not cold, not hot). Always take your meat out RIGHT before it’s reached your preferred done-ness, as the “carry-over heat” will continue to cook your meat after it comes out of the oven. So if you take out your steak when it’s perfectly medium, it will be medium-well after it rests. Do NOT cover it with foil, this will create trapped steam and all that crispy skin and sear will become mush. Just let it be. Let all of your meat rest for about 5 minutes before serving. Fish you can serve immediately as it will get cold quickly. That’s it! This is really easy to do once you get the hang of it and you will be cooking restaurant-quality meals in no time. I will cover pan-sauce another time, but that will be your next step once you’ve mastered pan-roasting. Bon Appetit! 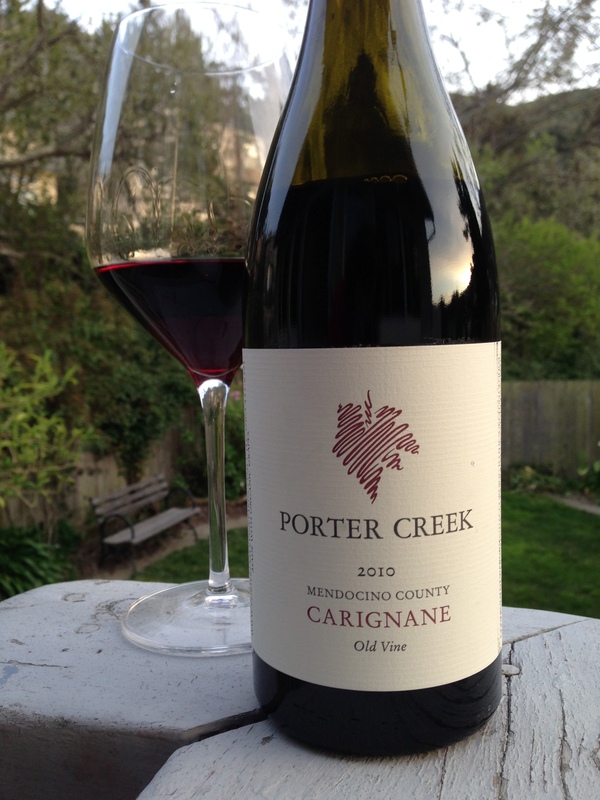 One of the first atypical varietal wines I ever loved was Porter Creek’s Carignan. It’s affordable at $25, rustic, unpretentious, juicy, approachable, fresh, brambly and fruity. It encompasses pretty much everything I love about wine and it’s one I love to share with people new to wine and to bring to dinner parties. Carignan originated in Southern Europe and is now widely planted across Italy, France, Spain & the US. Because of it’s heritage, it makes for an extremely food-friendly wine. I love to pair it with Italian-inspired dishes and tonight I will be serving it with pan-roasted chicken legs, rapini with pancetta and creamy polenta. I’ll be on the lookout for more producers of this delicious varietal! Let me know in the comments if you know of one. In California, rosé wines are the harbinger of Springtime. They spent the winter settling and resting, preparing for being bottled. 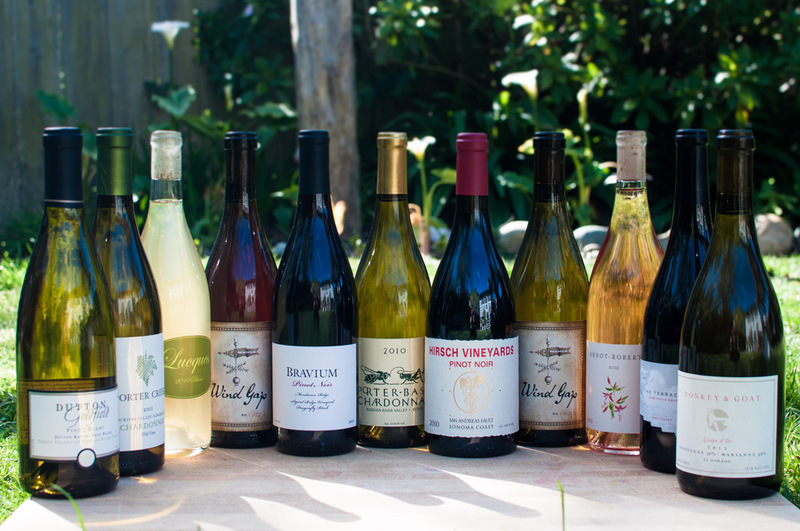 Come March, you start to see the previous year’s gently-hued, feminine wines hitting the shelves at your favorite restaurants, wine retailers and wine bars. These fresh, easy-to-drink wines are affordably priced, simple to understand and great with food. This weekend I went up to Sonoma to pick up the new Arnot-Roberts rosé of 80% Touriga Nacional & 20% Tinta Cao. I fell in love with this wine last year. This is what I consider to be one of the best California rosé wines on the commercial market. It’s fresh, lively, complex, aromatic and full of energy. This wine is perfect for a sunny Spring day like today, even if it’s not technically Spring yet. At $22, you’d be hard-pressed to find a nicer wine for the money. Rose is a truly versatile food wine; you can pair it with almost anything. Grilled seafood, pizza, barbecue, charcuterie, pork and grilled vegetables all come to mind. It’s truly a wine for grilling & Summertime, best served chilled and while sitting in your back yard on a warm night. While we were in the neighborhood, we paid a visit to Iron Horse Vineyards (open to the public, great sparkling wines & view), Wind Gap Wines (appointment only), Dutton-Goldfield (great Pinot Noir & Pinot Blanc), and Porter-Creek Vineyards (amazing Pinot Noir, Chardonnay, Carignan & Syrah). Lots of the wineries in the area have released their Spring wines and we took full advantage. I tasted over 20 wines and bought more than I needed to! You would be hard-pressed to not believe it’s Spring today in the Bay Area. I went for a hike at San Bruno Mountain State Park and saw many of the lovely native wildflowers in bloom. Forget-Me-Nots, California Poppy, Lupine & Irises. The weather was outstanding; 65 degrees but it felt more like 70. We have had a few lackluster wildflower seasons for the last few years around here, but maybe this year will be different. Looks great so far. I once received a book from a foodie-friend for my birthday. The title was An Everlasting Meal: Cooking With Economy & Grace. This book completely changed the way I cook; no longer do I rely on recipes, going to the grocery store to buy ingredients I think I need, spending frivolously just to make a meal the way I think it’s intended to be. This book taught me versatile cooking techniques, how to stretch your ingredients, and how to improvise. One of the techniques I learned from this book is how to cook dry beans. I love beans. They are rich in fiber, protein and are heart-healthy. They lower cholesterol and make a nice compliment to any meal. They keep very well after being cooked and one pound of beans goes a long way. My favorite purveyor of beans is Rancho Gordo. You can find their beans in natural grocery stores in the Bay Area as well as farmer’s markets. They are located in Napa and have a huge variety of heirloom beans at reasonable prices ($5.50/lb). I never knew beans could be so good until I started cooking with these employing the technique I learned in the above referenced book. My favorite variety is called Good Mother Stallard. They are velvety smooth and make an awesome bean broth. Cooking beans is very simple. Generally it starts with a long soak. You only need to soak beans if they aren’t super fresh. Rancho Gordo beans don’t need to be soaked because they are always fresh, but I do anyway to reduce overall cooking time. Once you soak your beans, you can drain them, rinse them, add fresh water, and get to cooking. 1. Soak your beans during the day if you are into planning ahead. This will save you time later on. 2. When you get home that evening, drain the beans (you can give this water to a potted plant, if you have one), give them a good rinse, then add them back to the same pot & cover them with two inches of fresh water. 3. Add a good, long pour of olive oil. Add a couple whole smashed cloves of garlic, a bay leaf, and any odds and ends you may have in your refrigerator. Carrots, celery, onions with skins, fennel bulb, parsley stems, fresh thyme sprigs, parmesean rinds & celery root all give great flavor to the broth. Throw them in there halved or quartered. Don’t overdo it. You don’t want your pot stuffed full with no room; the beans need space to expand. Do not add salt yet. 4. Bring the beans & things to a boil, then reduce heat to a simmer. I like to cover my beans to prevent the water from evaporating, and you also require less heat to simmer them this way. This saves energy. 5. Cook those puppies until they are tender and have a smooth consistency when eaten. This generally takes about an hour and a half from start to finish. They are done when you sample five beans and they are all delicious and smooth. Do NOT be afraid to taste as you go. Don’t over-cook or under-cook them. Add salt to taste at this point. Wait a minute or two, taste again, and adjust salt if needed. Turn off the heat. 6. Remove all the odds and ends from your delicious beans & throw into the compost bin. You’re done! These beans can be used in any way and stored in mason jars in the fridge for up to a week. Sometimes I’ll reheat a pint of beans w/broth in a small pot and poach an egg IN the beans. Beans are great in soups, by themselves, with anything pork, mixed with sauteed bitter greens such as kale or beet greens, served alongside sausage, with fish, you name it. The greatest thing about these beans is the broth; even if you’ve eaten all the beans, save the broth in jars in the freezer and use it as a soup base. Nothing gets wasted. I enjoyed these beans tonight with Fatted Calf Lamb Merguez Sausage & beet greens sauteed in olive oil. Delicious! One of the things I’ve learned is that wine is something that should be enjoyed every day. I like to treat wine like a part of life, like cooking. It can be prohibitively expensive, and that scares a lot of people off. It’s hard to find a great California wine in the $15-$25 range; it’s even harder to find good wines cheaper than that. Wine is one of those things where, unfortunately, quality often dictates price. However, you can find some exceptional values in some of the less “popular” wine varietals such as Syrah and Carignan, in rosé wines, and in those which are grown in lesser-known AVAs. I also think people don’t cook at home enough. Our busy lifestyles have created a culture where people often eat out for every meal of the day. It’s so hard to maintain a healthy diet when you are letting someone else prepare your food and you have no control over what is going into it. Additionally, eating out is expensive. Cooking at home may be cheaper, but it’s also time-consuming and exhausting. I prefer to prepare easy but delicious meals on weeknights. One of my favorite weeknight meals is fresh ravioli from The Pasta Shop. This is a local purveyor of freshly made pasta with exceptional quality ingredients. You can buy them by the pound at their flagship store (linked above) or in many local grocery stores & Farmer’s Markets across the Bay Area. A package of fresh pasta is around $5 (serves 3-4) and a package of the fresh ravioli is anywhere from $8-$13 (serves 2 as an entree) depending on what the filling is. Every weekend I buy a package of these ravioli from the Pasta Shop stand at the Ferry Plaza Farmer’s Market. Preparation is super simple. Bring a pot of salted water to a boil, drop in the ravioli, then simmer for 6.5 minutes. Drain, then toss with good olive oil and a handful of fresh arugula leaves. Place into bowls, grind some fresh black pepper over the top, give a good grating of aged organic Parmesean and voila! One of the best meals you could imagine in less than 15 minutes. Tonight is our Ravioli night and this week I bought the Sweet Onion & Red Chard ravioli in Roasted Red Pepper pasta. This is totally vegetarian and $10 per pack. It’s not cheap by any means but you would easily pay $15-$20 for a plate of these ravioli in a restaurant. These aren’t your Chef Boyardee ravioli of yesteryear. They are unbelievable. The wine I am serving with the ravioli is Broc Cellars 2011 Carbonic Carignan. This wine is fresh, juicy, fruity, lightly tannic, medium bodied and slightly herbaceous. 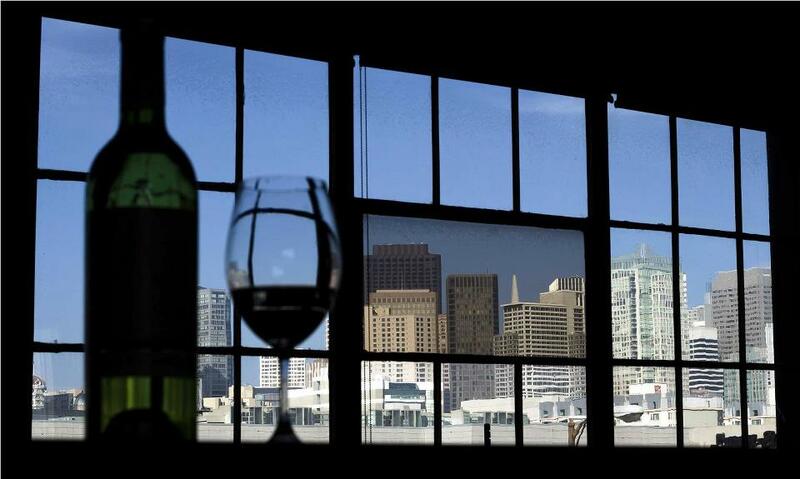 Carignan is often used as a blending grape but is catching momentum in California as a varietal wine. They are generally very easy to drink and inexpensive. I think it will pair nicely with tonight’s pasta. This wine is made in a similar style as Beaujolais called Carbonic Maceration. It produces a wine that is generally lighter in body, fruity, fresh, easy to drink when young, and can be slightly herbaceous because of the stem contact during fermentation. I like to pair slightly-vegetal tasting wines with vegetarian food since they seem to really play nicely together. This particular wine is drinking nicely right now, I highly recommend you drop by the Broc Cellars tasting room in Berkeley to try it yourself and maybe go home with a bottle or three. Today the sun was shining and it begged me to come outside for a Sunday afternoon picnic on our local San Bruno Mountain. The timing couldn’t have been better; yesterday I made a trip to the Ferry Plaza Farmer’s Market and had a refrigerator full of goodies suitable for picnics. Earlier in the week, I received several half-bottles of Robert Sinskey Vineyard’s 2009 Napa Valley Pinot Noir. I wish more producers made splits. It’s the perfect amount of wine for two on a Sunday afternoon. I grabbed one of these splits, packed a picnic and found a grassy knoll to lay out our spread. I love to pair picnic foods and wine. A great pairing really takes what could have been an ordinary experience and makes it extraordinary. Domestic Pinot Noir is generally so agreeable that it can make a very versatile food wine. Today I paired it with L’amuse aged Gouda, pimento-stuffed green olives from Nash’s Olive Oil (available at the Alemany Farmer’s Market), sheep’s milk ricotta & McEvoy Ranch wildflower honey on a Semifreddi’s sweet baugette, hot smoked salmon, and Twin Girls Farm blood oranges. This aged Gouda lends itself quite well to fresh, pure, fruity California Pinot Noir. The mild sweetness and caramel-laden creamy goodness of this cheese is perfect with the rich and complex wine. It can be difficult to pair cheeses with red wine but this has been a winner ever time I’ve had it. The cheese itself is really unique and delicious. It has a sweet and savory character, wonderful creamy paste and lots of pockets of protein crystals which add loads of texture. Another unexpected pairing I discovered was these beautiful blood oranges with the wine. They are very similar in richness, acidity and juiciness to the wine. Blood oranges are sweeter, less acidic and more floral than their pure orange brethren and are one of my favorite seasonal fruits. Right now it’s the end of the season for these in California. I’ll miss them! It’s days like today that remind me of how lucky I am to live in such a rich, diverse place. This picnic tasted like the California landscape that has inspired me for so many years.